Prince Alfred (the future King Alfred the Great) leads the Anglo Saxons of Wessex on behalf of his brother King Ethelred against the Danish invaders under King Bagsecg, King Halfdan and five Earls. The shield wall formation, according to Alfred's chronicler Bishop Asser, clashed around a simple thorn tree of stunted growth. One thorn does not play a role in the developments of a battle, so I believeit is mentioned by Asser because it had a symbolic religious connotation. Whether the thorn existed, it had meaning to those at the time who read about it. It is for this reason that I decided to add Asser's Stunted thorn to the painting.  To illustrate its inclusion may be due to Christian meanings I have highlighted it with rays from the sun. Crows in this part of the painting represent the Pagan army and their use of Odin's Ravens on their battle banners. Yorkist field artillery set up near the base of the slope coming down from the Queen Eleanor Cross, facing the south side of the Lancastrian defensive fortifications. 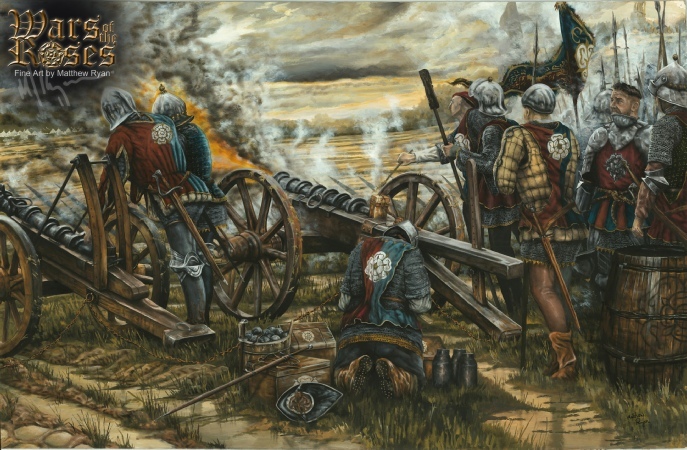 The gunners are depicted as retainers to the eighteen year old Edward Earl of March. On 25 June 1460, disinherited Yorkists invaded England from their base in Calais. On 10 July 1460 they meet a Lancastrian army lying in wait for them between Hardingstone and Delapre Abbey near Northampton. 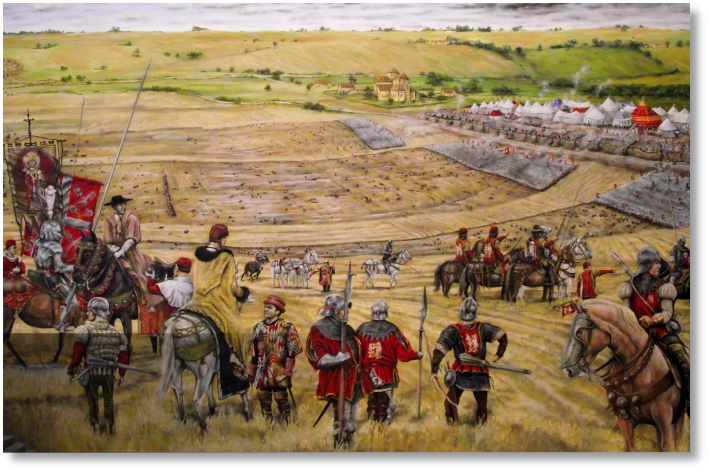 The Lancastrians were in a fortified camp armed with cannon, and it was to be the only time during the Wars of the Roses that a fortified camp was assaulted. 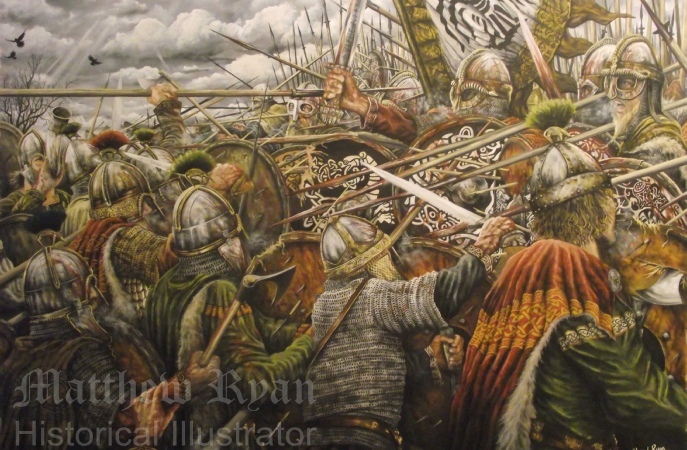 There is a period of intense negotiations between the two sides and when they fail the Yorkists decide to attack. After a cavalry battle outside the defences, the Yorkists assault the camp. One of the Lancastrian commander's, Lord Grey of Ruthin, changes side at the last minute and helps the Yorkists into the camp. In the rout that follows the senior Lancastrian lords are cut down around the King's tent and King Henry VI is captured and taken back to London. 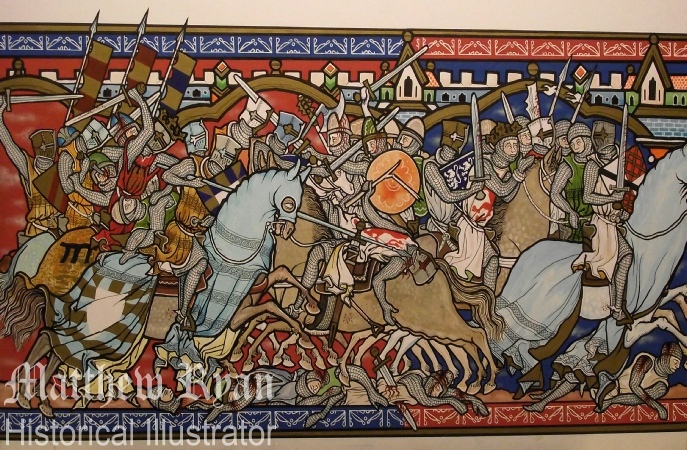 Showing Simon de Montfort being killed by Roger Mortimer. Gilbert de Clare and Prince Edward are shown behind Mortimer and in the painting is also the captive King Henry III and the knight that is said to have pulled him from the melee, Roger de Leybourne who has the shield with arms of six white lions on a blue field. Hugh Despenser is depicted on the far right of painting. I have chose to show de Montforts Coat of Arms in the colours that Matthew Paris painted them in his role of arms and also in his contemporary depiction of the Battle of Evesham. Towards the end of the battle the Turkish army set light to the grass as either a signal to their camp to start a retreat or as a means of trying to separate themselves from the Frankish Crusaders. 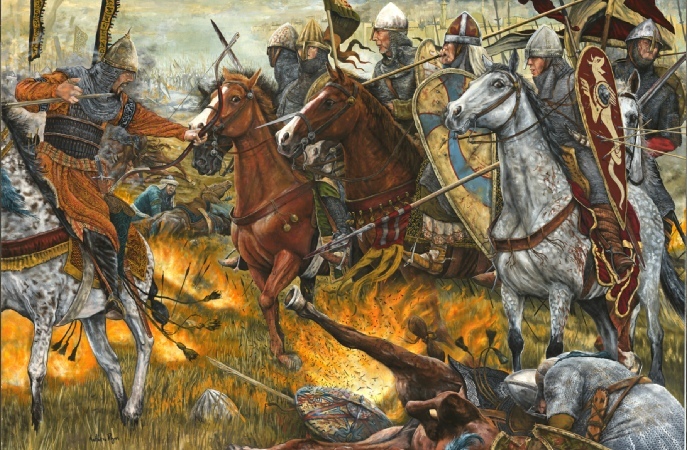 Either way it did not work and the Franks, mounted on a combination of their own starving horses or mounts left by fallen Turks they chased down the fleeing enemy and a route soon ensued. "Our men were free to slice up the bodies of the Turks just as the corpses of beasts are cut apart in the abattoir. Blood spun away from bodies of the wounded; dust spun away from the feet of the galloping horse. The air was clouded and darkened as if at dusk." Robert the Monk, from his Historia Iherosolimitana.